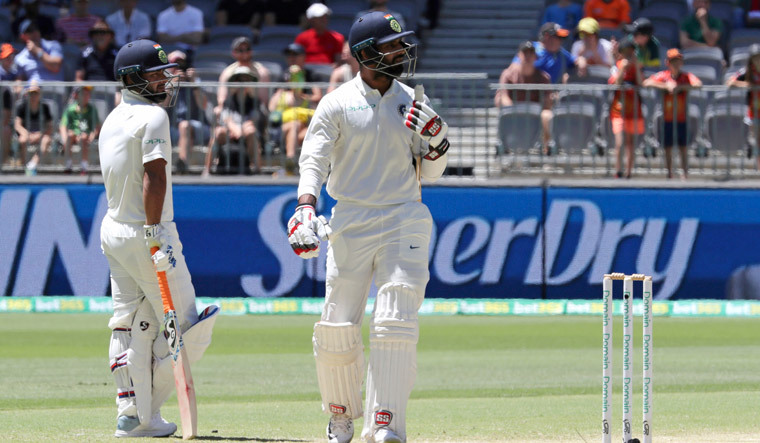 India's lower order collapsed quickly on the fifth day of the Perth Test to give Australia a comfortable 146 run victory. Resuming on their overnight score of 112 for 5, the last five Indian wickets fell in the space of just nine overs for 21 runs. The first wicket to fall on the day was overnight batsman Hanuma Vihari, who was out for 28. Wicket-keeper Rishabh Pant, on whose shoulders any slim chance of an Indian victory rested, was next to go, falling to spinner Nathan Lyon for 30. The tail followed quickly without doing much to trouble the scorers, with both Ishant Sharma and Jasprit Bumrah falling to Pat Cummins. For Australia, both Nathan Lyon (3 for 39) and Mitchell Starc (3 for 46) topped the wicket tally, while Josh Hazlewood and Cummins got two wickets each. The victory has allowed Australia to square the series after India won the first Test at Adelaide by 31 runs. Two more Tests remain, with the next match starting at Melbourne on December 26. Nathan Lyon was declared player of the match for his total match haul of eight for 106, including the best match figures of five for 67.